The FACTOR Prizmo line of lights brings broadcast quality creative lighting and affordability together in a powerful and portable package. Each FACTOR Prizmo light includes several built-in control modes including CCT mode for white light adjustable from 2800K to 10000K with adjustable magenta and green points, HSI mode to access the full 360° color gamut and RBGW mixing mode. There is also a pre-programmed filter mode to assist in matching industry standard gels as well we as pre-programmed special effects modes including police car, fire, party and fireworks effects. FACTOR Prizmo lights can be controlled via the back control panel, DMX512 controllers or the included 2.4 GHz wireless remote control. FACTORSOFT™ technology creates beautiful, strong, single-source light without the shortcomings of conventional LED panels. Factor lights are ready to go for right out of the box, no extra diffusion or accessories needed and create a strong, diffuse light with no hotspots with a single, soft, clean shadow and a CRI ≥95 making them great for photo or video shoots. 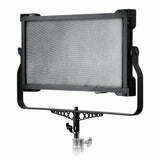 FACTOR lights are also flicker-free making them a great option for any shooting scenario, including slow motion video. FACTOR Prizmo lights have a solid aluminum frame for durability and added heat dissipation. The “silent running” intelligent cooling fan ensures that your lights won’t overheat without adding fan noise to your shoot. The heavy-duty, all metal yoke and ball head allow you to mount on stands or hang in any suitable location. FACTOR Prizmo lights also feature DMX control compatible with any DMX 512 control console. Using a DMX console will allow you control color temperature and brightness remotely as well as the ability to create lighting presets to save you valuable time. Color temperature, brightness, DMX Channel and remaining battery power are all displayed in real time on the rear LCD display. Each FACTOR Prizmo light comes in a custom fit wheeled case to make transporting them safe and simple.